That old saying … a picture is worth a thousand words. Well, its especially true for online dating. 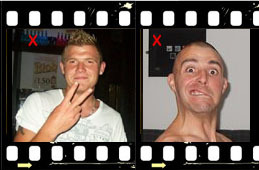 Its a fact that more than 95% of profile pictures are substandard and 70% are a MAJOR turn off? Sorry guys but we are particularly bad at this and need quite a bit of help. You can spend all that time writing a well-crafted, charming profile, but if the person looks at the picture of you in your CKs or next to your sister, she will be instantaneously turned off and scrolling for the next profile. There are several basic errors which can be seen on profiles throughout all the main online dating sites. A picture is worth a thousand words…everyone knows that …right? So why is it then that I still come across online profiles with no photos displayed. Displaying no picture is a very negative message. It might say ‘I’m hiding something’, ‘I’m insecure’, ‘I’m lazy’. A blank silhouette can often say more than a photo and it’s never a good statement. That’s why sites encourage you to post a picture, with some sites claiming that profiles with pictures get a 70% higher response rate. Just finishing up a relationship or MARRIED! Don’t want to be chosen for how they look. Not happy with their looks. FACT: Most online daters will not reply to profiles without a photo. I’ve personally tried to look at all profiles, including those without a picture and it’s been a struggle. Photos really help to bring the words alive and vice-versa. You really need both to make a great impression. Photos can be windows to your soul. They can really tell a lot about someone and who they are. The choice of room, the choice of clothing, the expression all give an idea of who you are and how you think. So make sure to include one! 2. Hats and Sunglasses ..What are You Hiding? Many guys are fond of posting pictures of themselves with hats or wearing sunglasses. Women want to see your eyes…they are often the window to the soul, and hats and sunglasses will take up ¼ of your picture. It also signals that you might have something to hide. Is the hat to hide a bald spot? Are the sun glasses hiding bulging eyes? Not that there’s anything wrong with those features…hiding them is the issue…cause if and when you meet up in future, all will be revealed. So better to meet someone who already knows what you look like …and wants to meet you because of that! Try to post your picture directly face on, rather than at some oddly positioned ‘model’ angle. Women want to clearly see what you look like, not just the left or right side of the face. You may even want to show additional photos at different angles. You won’t walk into the restaurant to meet the person and only show them the right side of your face, so what’s the point in trying to hide a certain angle? Ah, the ever-popular hand signals. We see so many of the ‘rock’, ‘f-you’ or even the ‘I heart you’ hand signals in photos. To this I say, your hands belong below your waist. You will rarely find someone who looks at your photo and says ‘Wow, look at that great hand sign’. More likely it will be, ‘look at this dweeb’. In a word NO! Silly hand signs or stupid faces just don’t work. Never have, never will. A good sense of humor is a great trait, but you don’t want to come off as a buffoon. Oh! I see you there, way in the distance next to the Washington monument looking like a peanut. Panoramic pictures are fun to show your worldliness but they do nothing for a headshot. Your headshot should clearly show your face. Not that it should look like a mug shot, but it should be close and clear enough that the person could recognize you on the street. 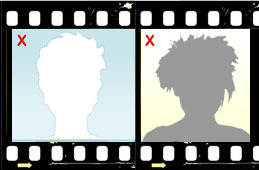 You can include your panoramic shots somewhere else in your profile picture suite, but the headshot should be just that. Even though this really seems like a ‘no brainer’ you would be amazed at how many men post pictures of themselves hugged up with other women. Perhaps they think it makes them look popular. Perhaps they think it makes them look like a hot commodity. Trust me, the only thing this will do is to make potentials go running out the door. Then there are those photos where we see the arm of a woman who has been cropped out of the photo. This is a HUGE no no! She’ll see right through this lame attempt and consider you a liar, deceiver and a cheat. And all of that before she’s even met you. It’s tacky so don’t do it! Believe me, she won’t think that’s your mother standing next to you. Also, don’t post pictures with your sister. No one knows it’s your sister, no matter how much you may look alike. Steer clear of this idea as it rarely ever works. You may be trying to say ‘I love my family and I’m a family man’, but it’s better to write that in your profile. So, to summarize, NO other women in the photo, whether that be your mother, sister, aunt, personal trainer, or RWS (random woman on the street). 7. Phone or webcam shots! Please invest the time to take a good photo of yourself. Don’t use mobile phones or as they have lower quality cameras. Pictures taken of yourself with a webcam are not only low quality, but they tend to look a bit creepy. At best self-shots are weirdly intimate and give off the wrong vibe so best avoid them. How recent are your shots? You are not fooling anyone but yourself if you try to post a picture of yourself 15 years younger. Sure, we all know that botox and plastic surgery are readily available; however, they can only do so much. I know a guy who posted a picture of himself 15 years younger. What he didn’t realize was that he was wearing a Pac-Man shirt and an outdated hairstyle. Needless to say, his responses were few if any. Sure it might have erased some of the wrinkles from his face but it didn’t erase the LIAR glaring from his profile. Women want to know what you look like now, not two years ago. Some people hold up a current newspaper to prove to seekers that it’s a current picture. If all of your pictures are old and outdated, then it’s time to update your photo gallery and get with the current century. Creators tip: Don’t use photos more than 6 months old. Black and white photos are very artistic but often don’t show a real good reflection of you. They often tend to fade out such things as moles and freckles. It’s best to present you in full color because that is what she will see when you walk in the door and it reduces the chances that she will go walking out of the door. You have kids and love them, great. You don’t have kids but want them, that’s great too. I can find this out in your profile description or even later when I meet you. Your profile photo is not the place for to post pictures of your kids. For the safety of your child, we recommend that you don’t post pictures of them on the Internet. So there you have it – 10 classic online profile photo mistakes …make sure to avoid these in YOUR profile.